The Office of Professional Development at the University of Redlands is coming to the end of its first year providing U of R students and alumni access to a new career management app and recruiting portal called Handshake. Fully mobile, responsive system for tablets, smartphones, computers, etc. Centralized platform to manage career development resources and support, including a “resource center” for career planning tools, articles, industry info, etc. We know the job market can be scary, especially to undergraduates looking for their first full-time professional opportunity. Handshake offers multiple ways for students to engage with potential employers and conduct employment research. One feature that allows for employer engagement is the ability for users to make their profile “public.” By doing this, company recruiters are able to reach out if the student or alumni fits the profile of a successful candidate for an open opportunity within their company. Users always have the choice to keep their profile private, though, and that is the default setting. Overall, Handshake has relationships with over 200,000 employers from Fortune 500 companies to local businesses, schools, and nonprofits in every state, offering something for everyone. 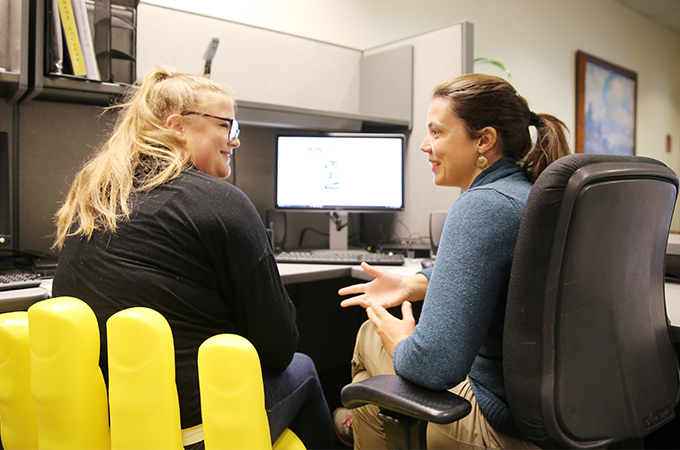 In addition to connecting students and alumni with potential employers, Handshake provides easy access to services and resources offered by the Office of Professional Development, including individual appointments, career development workshops, employer information tables and events, and other resource material. During the spring/May semesters, individual appointments and 20 workshops were offered on such popular topics as internship/employment research and strategy, résumé/curriculum vitae (CV) and cover letter development, interviewing strategy and practice, graduate and professional school planning, and personal statement development. In addition, new workshop topics included LinkedIn profile development, networking, and Handshake utilization. Students can also sign up for employer visits to campus through Handshake. In the past academic year, Target, the Federal Bureau of Investigation, and Burlington Coat Factory all sent representatives to the U of R. These events provide an opportunity for students to develop a face-to-face relationship with employers, as well as to find out which employers are hiring and what they are looking for in candidates. We look forward to seeing students, alumni, and employers continue to engage Handshake to advance their goals. To learn more about the platform, visit the Handshake website. If you are a U of R student or alumnus, visit the Professional Development website to explore this great system today!